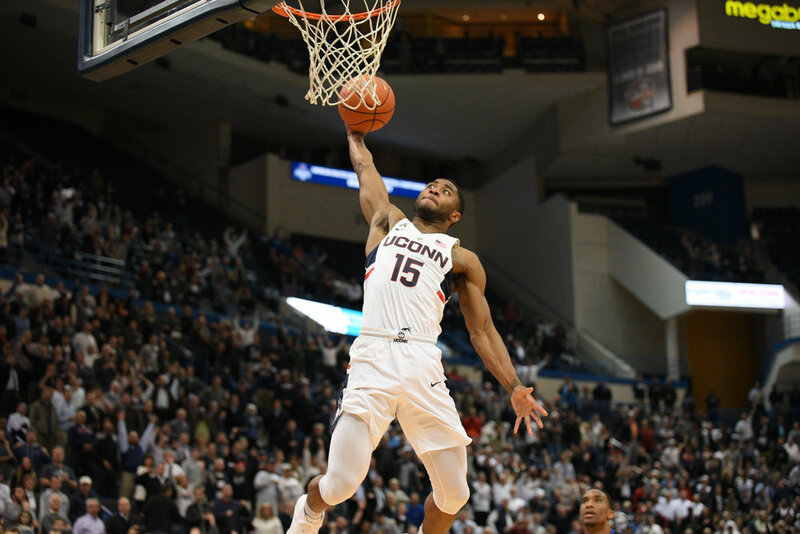 HARTFORD— After falling down by 14 points at the end of the first half, the UConn men’s basketball team cleared yet another hurdle in a seemingly never-ending race, grinding all the way to the end to pull out a 65-62 win over Memphis at the XL Center. The game started the only way it could have, with Amida Briamah slamming back-to-back dunks complimented with two defensive stops in a row. Memphis (18-9, 7-6 the American) hit two 3-pointers when UConn (13-12, 8-5 the American) missed three of their own to help them take a quick 11-8, throwing the Huskies off track. After a Christian Vital three, Memphis scored six straight points to take a 17-11 lead with 13 minutes to go. The Tigers were able to take advantage of both UConn’s sloppy defense in the paint and shaky ball handling to swing the momentum in their favor. Brimah hit a single free throw to bring the score within five, but Memphis’s Craig Randall sunk his second bucket in a row, a straight away 3-pointer that put Memphis up 26-18 with six minutes to play. For a team that shoots 30.3 percent form beyond the arc, the Tigers had what seemed like a strong first half, going 4-for-9 from three, hitting the shots when UConn desperately needed them to miss. The Tigers went on an 11-1 run in the with six minutes to go. After UConn essentially stopped trying in their previous meeting with Memphis, fatigue seemed to set in once again, to the tune of missing five shots in a row and putting up weak post defense. “When their bigs were getting it in the post, we were double-teaming and we wasn’t doing a good job rotating out, they would set their feet and get shoot-around shots,” Jalen Adams said. Rodney Purvis finally broke UConn’s cold streak from three, sinking a shot with 2:30 to go and cutting Memphis’s lead to 14. After forcing a turnover, the seventh of the half, Brimah dropped a floater to give UConn some much-needed life. The first 20 minutes concluded with Memphis drawing a foul with one second left on the game clock and hitting two out of three shots, ending a clunky first half with a score of 40-26. The Tigers shot an impressive 48.1 percent from the field, while UConn shot just 33.3 percent, including a dismal 2-for-12 (12.6 percent) from three. UConn desperaptely needed a comeback in the same fashion as overcoming a 13-point deficit against Tulane on Jan. 28, but the boat wouldn’t stop rocking. Try as they might, UConn could not gather enough collective energy to sustain their runs. As soon as they would get the score back within two possessions, the Huskies failed to get a stop, allowing Memphis to keep a safe distance. Thanks to the efforts of Adams, who exploded for 18 points in the second half, UConn found themselves down 60-53 with just under five minutes to play. But finally, things swung in full favor of the Huskies. After six straight points, Adams charged into the lane after a big stop and gracefully popped up a floater to give UConn their first lead since the first two plays of the game. With 30 seconds to go, a score of 61-60 in favor of the Huskies on the board and another stop under their belts, UConn stood on the opposite baseline, ready for an inbounds play to decide the game. After nearly turning the ball over, UConn performed an almost miraculous feat, hurling the ball three quarters down the court to a wide open Vital, who vivaciously slammed home a massive dunk to put UConn up 63-60 with 23 seconds left on the clock. Memphis would chuck up a couple last-minute threes in a desperate attempt to tie, but it would prove to be unsuccessful. Jimario Rivers would lay in a dunk, but Purvis took it coast-to-coast to close out the game with another dunk, perhaps a statement to how much fight UConn has in them, making the final score 65-62. Despite Memphis boasting the 15th-best assist to turnover ratio in the country, the Huskies forced 17 Tiger turnovers, scoring 24 points off of them. UConn only committed eight. Up next, UConn will travel to Philadelphia to play a must-win game versus Temple on Feb. 19. Tipoff is scheduled for 4 p.m.